In most years, March 25 falls during the season of Lent. 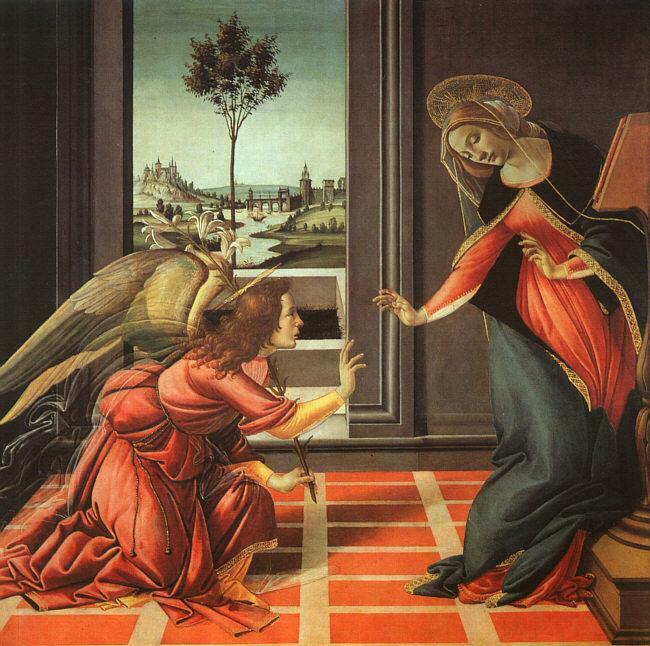 But every year, March 25 is the Feast of the Annunciation. It is a celebration built around the story from Luke’s Gospel in which the girl Mary finds herself in unexpected conversation with the Angel Gabriel, who invites her to become the mother of Jesus. She is not exactly sure how this is to happen, and the angel is frankly short on specifics: “The Holy Spirit will come upon you, and the power of the Most High will overshadow you; therefore the child to be born will be holy; he will be called Son of God.” And so the adventure begins. The story that came to be known as the Annunciation (because the angel announced or annunciated God’s invitation to Mary) is one which a lot of people have difficulty with. After all, we have likely had no experience with angels (that we know of!) and the idea of a Virgin Birth is not only outside our experience but something which modern medicine can’t quite seem to work out. Yet I am convinced that theology is at least as much poetry as anything else, and so I wonder what we might learn if we are willing to enter into the poetry of the story. I must admit that Mary is a figure I respect very much. If you come to my office, you will find at least six depictions of her scattered across shelves and walls. To me, Mary is an iconic figure, representing what every Christian person is called to do and to be. More than that, in her story I think we learn exactly how it is that God seeks to work with each one of us and we see what it is God seeks to bring about in each one of us. The first thing about the Annunciation story that attracts my attention is that initially, Mary is not thinking about God. It is not as if she is on her knees, praying fervently, and has a vision of an angel. Rather, she apparently is just going about her business and, rather unexpectedly, God breaks into her daily life and offers her something extraordinary. Most of us are like Mary at the beginning of this story most of the time. We are not sitting around spending lots of time thinking about God. We are instead thinking about whatever it is we need to think about in order to make our way through whatever day we happen to be in. Mary’s story reminds us, however, that even amidst the daily ordinariness of our lives, God can (and does!) break in and invite us to go deeper into the Mystery upon which that daily ordinariness depends. That quality of invitation is the second thing I notice about the Annunciation story. Mary is invited into a particular kind of journey with God, and that invitation says something to me about the way God approaches each of us. So often, I think, we speak of God as commanding and ordering and expecting. But this piece of theological poetry does none of that. Mary is invited to be God’s partner in this journey into Jesus, and the very nature of invitation requires from Mary a response – one that will certainly affect the way her life will be shaped. And Mary does respond. She agrees to be God’s partner, and thus it is through her that Jesus comes into the world. We are accustomed to Mary’s title as Virgin, but that is not actually the oldest title that has been given to her. The more ancient title in Greek is Theotokos, which translated into English means “God-bearer”. Mary is invited to be the bearer of God in the world, and the result of her agreement to do this means that she gives birth to Jesus. In a spiritual sense, I think we are all invited to be the bearers of God in the world, and to give birth to Christ in the depths of our own beings. It is a metaphor for the kind of transformation to which the Christian life is meant to lead us, and it is a metaphor for the kind of transformation that we are to invite the world into. And so the poetry of Mary’s story for me unfolds the heart of the Christian life: that God seeks to speak to me in and through the daily ordinariness of my life; that I am invited to become God’s partner in my own transformation and that of the world; that I must consent to be God’s partner, perhaps even on a daily basis; and that as I continually consent to this partnership and try to live into it, I do become in some way a bearer of God in the world and allow Christ to come into being within me. So, as the calendar falls this year, as we stand on the threshold of Holy Week and Easter, we are given an opportunity to step back and remember the beginning of this adventure of which Easter is the culmination. We are given the figure of Mary to contemplate, and in her we find a courageous young woman willing to join God in the on-going work of redemption and transformation. As you so well know, Our Lady has been a spiritual mentor for me for a very long time. Her courage at accepting God’s call to her is like a light in the darkness for me whenever I am going through tough times or difficult decisions. “Be it unto me according to Thy word.” Thank you for this beautiful tribute to her. Amazing that as I was reading your lovely poetic interpretation of the annunciation, KDFC was playing Gounod’s Ave Maria. So divine! Thank you, Matthew.